Students at Avanti High School were able to participate in the project through their art class. Did you know it takes 2,000 gallons of water to make one pair of jeans? Local artist Carrie Ziegler shared this fact with me while discussing her latest project. Carrie has been working on the project for one year. The finished project will hang at the WET Science Center located inside the LOTT Wastewater Treatment Facility. 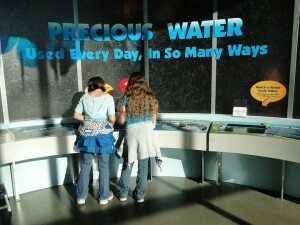 She has partnered with LOTT to increase awareness about water and how our choices impact water usage. “We only have a certain amount of water. It’s a finite resource. We don’t make more water. With over 7 billion people on Earth, we now impact water in a way we never have before. If we are not careful about how we use it or how we clean it, we are going to be in trouble,” Carrie shares with me as she explains why this project is so important to the community. Artist Carrie Ziegler says she hopes the students gain an understanding from the project of something bigger than themselves. This is not the first time Carrie has connected conservation and art together. 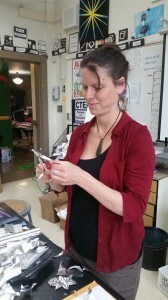 She has a background in environmental education and has completed other large-scale art projects in the community. “For me, the projects that I work on are all about personal empowerment and creating changes in our own lives,” says Carrie. And that’s exactly what Carrie is hoping the 1,200 students and community members that contributed to the project will take away from her latest piece. 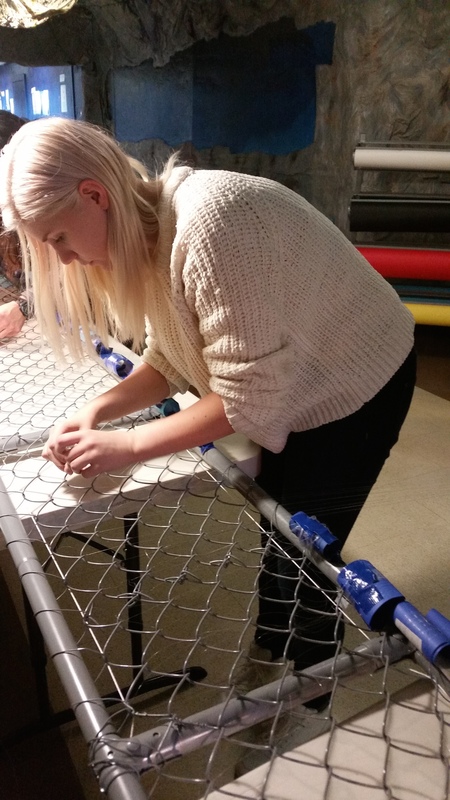 One student works to create the lines which will suspend the aluminum pieces from the ceiling. The final art piece will reside in the front windows at the WET Science Center and resemble the infinity symbol. Carrie says she chose this symbolism because it has no beginning and no end, just like the water cycle itself. She hopes it will help draw people inside so they can learn about water. 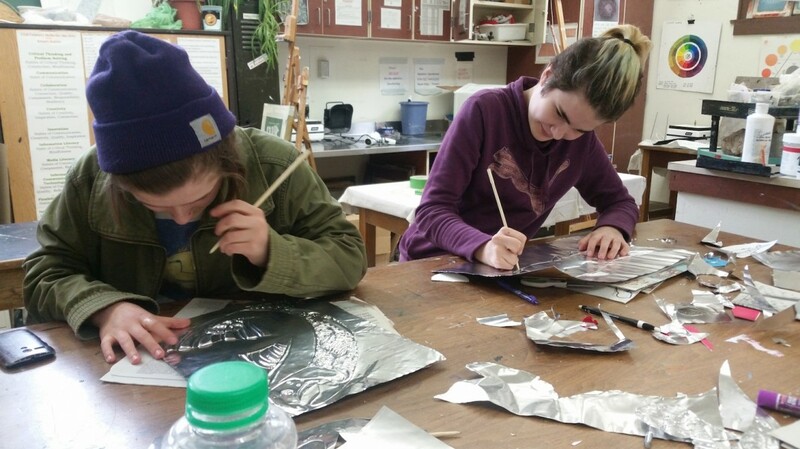 “Carrie’s ability to blend environmental education and art is inspiring,” says LOTT’s Education Program Manager, Amber Smith. “LOTT is really looking forward to sharing this unique art installation with the community and hope it will inspire people to become stewards of our most precious resource.” Amber tells me that LOTT is always looking for new and innovative ways to educate the community. She says they will incorporate the artwork into their green building tours and public education programs. The art project, coordinated by Carrie Ziegler, will be displayed at the WET Science Center. The finished piece is set to make it’s debut on Friday, April 22, 2016 during the first night of Olympia’s Spring Arts Walk. Added bonus – the unveiling happens to coincide with Earth Day this year. See Carrie Ziegler’s creation at the WET Science Center located at 500 Adams Street NE in downtown Olympia. The educational facility is open Monday through Saturday from 10:00 a.m. – 4:00 p.m. Admission is free.